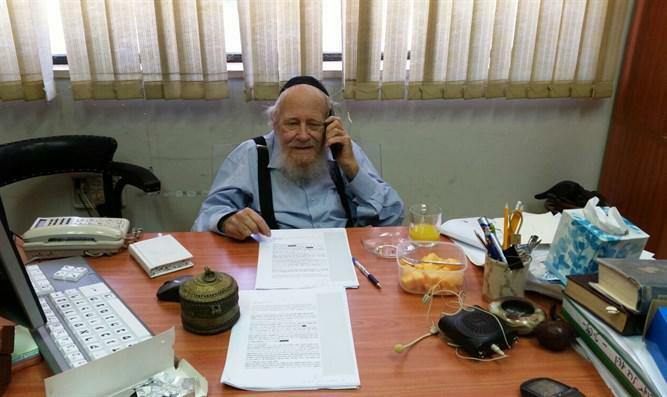 President Reuven Rivlin called Rabbi Adin Even-Israel Steinsaltz Sunday to congratulate the rabbi and wish him good health on his 80th birthday. Rabbi Steinsaltz is considered one of the great rabbinical commentators and scholars of this generation, and has written numerous world-renowned commentaries on the Bible, the Talmud, and many other religious Jewish texts. Rabbi Steinsaltz suffered a stroke six months ago. The rabbi recently returned to work, to the joy and relief of his students and colleagues. An event was held earlier this month in celebration of the release of Rabbi Steinsaltz’s new commentary of the works of the Rambam (Maimonides). President Rivlin called Rabbi Steinsaltz by the title for Torah sages, “our teacher and rabbi.” The president noted that he had learned Talmud in his youth, but not as much as he would have liked. “Had there been a Steinsaltz edition of the Talmud when I was young, we would have learnt much more Talmud at the Hebrew Gymnasium school in Jerusalem.” The president concluded the conversation with a blessing: “Congratulations, and you should have many more productive and good years, first of all with good health, as well as wisdom and the continued ability to learn, to teach, and to glorify the Torah in Israel. Those in the room during the conversation said that the rabbi was very moved by the president’s words and warm wishes. Rabbi Adin Even Yisrael-Steinsaltz was born in Jerusalem in 1937 to a secular family. He studied chemistry and physics at the Hebrew University, worked as a school principal, became observant and chose to focus on the writing of Jewish books on various subjects, the most famous of which was the ‘Steinzaltz Talmud,’ a commentary on all 2,711 pages of the Babylonian Talmud. Rabbi Steinsaltz received the Israel Prize for Jewish studies in 1988 and the President’s Prize for his scholarship in Talmud from former President Shimon Peres in 2012.